Lettice Cooper grew up in Yorkshire, where her father ran an engineering firm, and afterwards lived in London for more than 50 years. She read Classics at Oxford University and then worked for some years in the family business. She had begun writing as a child and published her first novel, The Lighted Room, in 1925. She was a devoted friend of Lionel Fielden, creator of All India Radio, friend of J.R. Ackerley and E.M. Forster, and often visited him at his villa in Antella, a few miles outside Florence. She loved Tuscany and used it as the setting for several of her books. 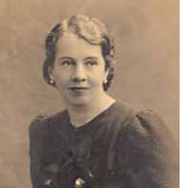 After a brief period at the feminist weekly Time and Tide, she worked at the Ministry of Food during World War II. She never married, and lived with her sister Barbara although they were political opposites. She was president of the English Centre of International PEN (1977-1979) and helped to establish the Public Lending Right program in the UK. Lettice Cooper is currently considered a "single author." If one or more works are by a distinct, homonymous authors, go ahead and split the author. Lettice Cooper is composed of 3 names. You can examine and separate out names.